HopHopClock is a simple and beautiful countdown timer that shows visually how time passes. The app motivates kids to beat the timer by providing a reward from successful outcome. 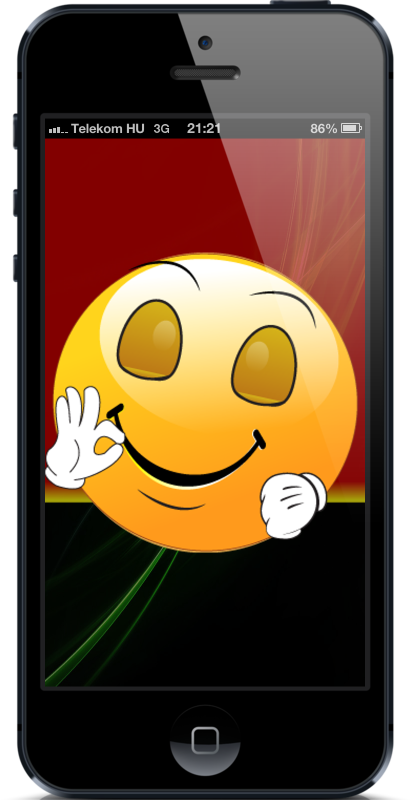 The parent can choose from various motivating pictures or animations, like smileys. 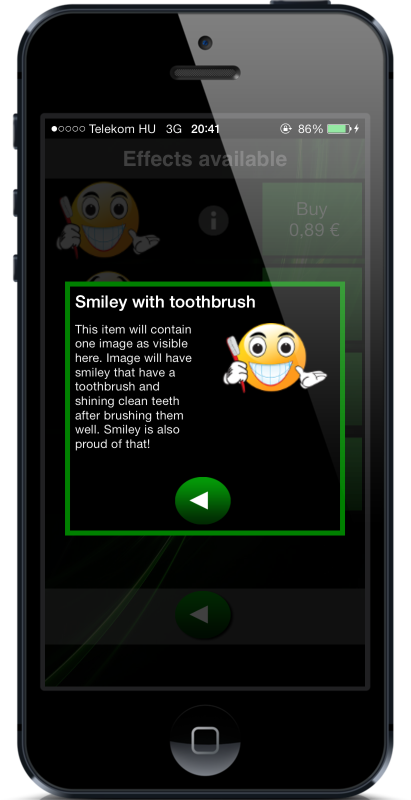 Parents may use the application when it’s time to brush teeth, to get up or to go to bed. It’s also useful for speeding up dressing up, finishing breakfast, lunch or dinner, etc. Another use for the app is limiting a child’s screen time. Or when kids have to share things so that they each have a limited time to use the computer, toys or anything else. The application also comes in handy in situations where a countdown timer is usually needed. For example, for boiling eggs, playing board games, or as a classroom timer or gym timer. The application has special settings that will add extra value for all of those use cases. It is more advanced than a mechanical egg timer/clock or sand glass. 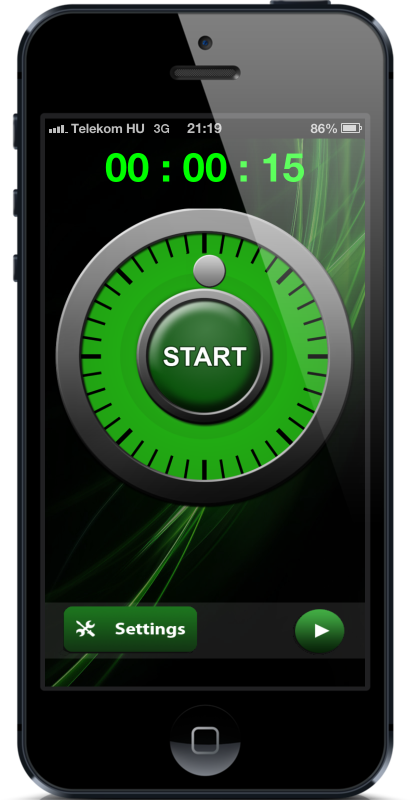 1) Touch and rotate the dialer to set the countdown time. 2) Tap the big Start button to start countdown. 3) Tap the countdown screen before the time is up to show the reward picture to kid. Set time by rotating gray knob in the dialer screen. Valid settings are from 15sec to 1:30 hours. Push ‘Start’ button to initiate the countdown of the time. To access ‘settings’ screen – push ‘Settings’ button on the bottom of the screen. Countdown screen will start as a wholly green screen. It will then turn gradually to red, starting from the top of the screen. When time has completely passed the screen has turned fully red. This turning is a strong visual illustration. It will help kids to understand that how the time passes. This will help them to focus to do the given task at time. Countdown screen contains also time box (depending settings) that will show how much there is time left in minutes and seconds. This will also help understanding concept of the time. When application is counting down it can also tick various ways and give the audible hints that how much time is left. See more in ‘Tick settings’. Settings screen has few options on top that can be turned on and off. If setting is turned on the button is having green background color. If it is off the background is grey. At the bottom of settings screen there is two other functions: recommend and feedback. Application has a few different countdown ticking options. Application can tick once per second like traditional egg clock (‘normal’ setting), or it can be set to ‘progressive’ mode. In ‘Progressive’ mode application will tick only once per [how many minutes are left] seconds. e.g. if there is 10 minutes time left then the application will tick every 10 seconds, and once there is 9 minutes left the application will tick every 9 seconds, and so on, until there is one minute left and application is ticking every second. This way the progressive ticking will give idea that how much time is left although user could not even see the device at all. This is handy for enhancing the visual illustration. Ticking setting will have also third option ‘End boost’, which is a option that can be used in addition of ’Normal’ or ‘Progressive’ settings. ‘End boost’ will make application to tick twice per second when only 10 seconds of time is left. This is especially handy for some board games like Trivial pursuit and others where there is limited time to make some actions. Last ticking setting is to turn the ticking completely ‘off’. Applications ticking volume can be adjusted by using device’s hardware volume buttons. This is pretty simple setting. It is ‘on’ or ‘off’. If it is ‘on’ then the countdown screen will have box in the middle of the screen that will show that how much time is left currently in precision of seconds. 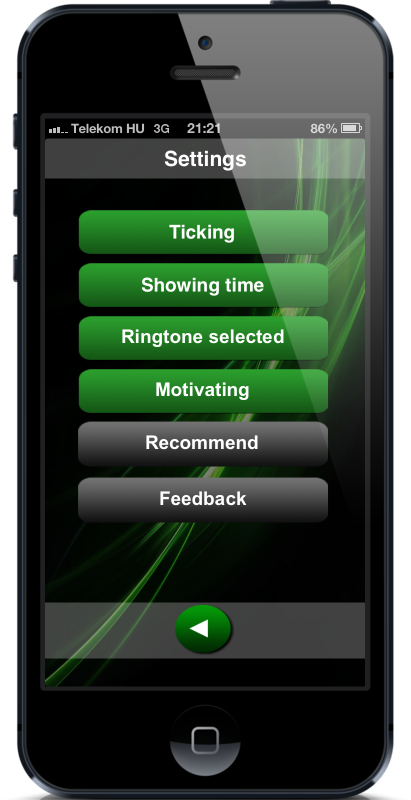 Ring tone or end tone is a setting that will control that does the application play any sound when the time is up. Ring tone is also ‘on’ or ‘off’ setting. It is working intuitively so that it is ‘on’ if any ring tone is selected. Ring tones are the ring tones that are in the phone’s library, so you might be able to add there your own end tones if you like. Setting ring tone ‘off’ is the top most option on the list. Feedback is very nice feature and I hope that I will get lot of feedback through it. This screen has two actions. First you can send anonymous feedback from the device directly to the application’s forum. It will also by pass CAPTHA test that is up on the web service. Forum messages do not show any identifying info unless you will write it to the feedback. However, all messages will contain random generated id that (my favourite part) it will allow me to answer you back in a way that only your application will notice it. Try it out and tell me what you like about the app! Secondly you can open external browser (from ‘FAQ, Comments’ button) to browse the forum and see what others have been writing. See FAQ or other notices. Recommendation button will allow you to recommend the application for others with various ways (e.g. SMS, email, Facebook, Twitter (available options depends on device and configurations of other apps)). I hope that you like the app and let your friends to know about it! I have still few nice ideas how to enhance the application and getting some decent user base is crucial for allocation more resources for implementing them. For the active recommender’s I have made small reward, so that they can get nice new free motivation image. One new image from three recommendation and 2 images from 6 recommendations. These reward images are issued automatically once recommendations receivers will click the provided link. Recommendation button won’t be visible at start, but it will come visible, if you continue using this countdown timer app for some time. Motivation is the second main feature of the application. As you see this screen is also very intuitive and easy to use. Just select wished images from two sliders and start countdown. If screen is tapped before time has passed the application will show the ‘In time’ effect in countdown screen and delight the Kid from successful act. If time will manage to pass fully, then the ‘Over time’ image will be displayed on the countdown screen. (I believe that stick and carrot is most effective, but you can just use positive effect if it suits better for you). 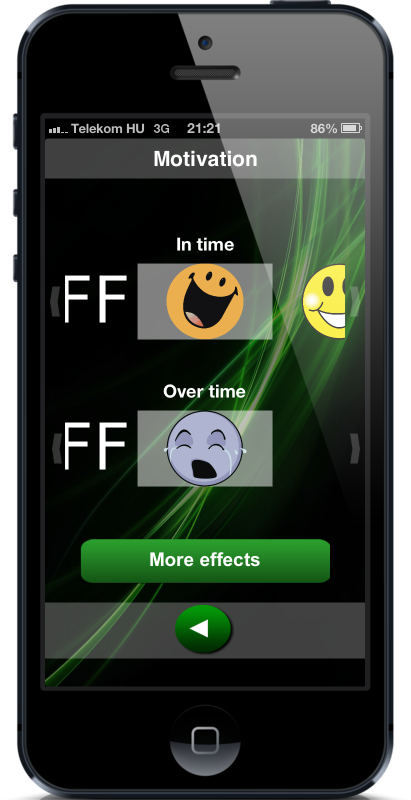 On this screen there is also ‘More effects’ button that will lead you to ‘Effect available’ screen. This button might have red end and some number in it. That number will tell that how many new items are available on next screen that you haven’t seen yet. This way you will notice at once if there is something new to check out. This screen will list some additional effects that can be added to the ‘In Time’ or ‘Over Time’ sliders. Some of the images are free and some will cost a little. 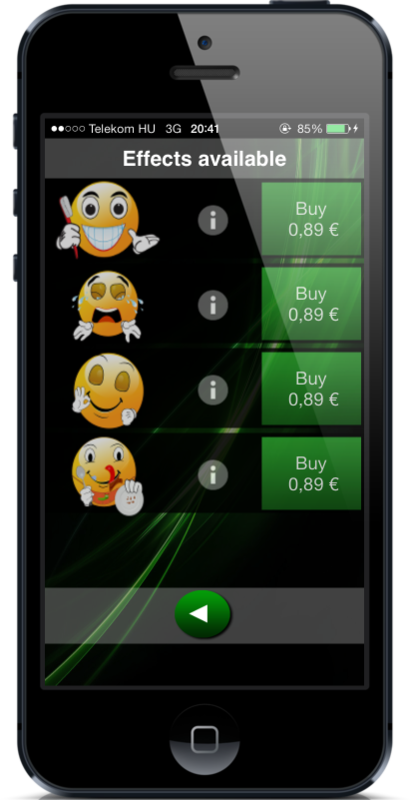 There is small illustrative image about the effect(s), info button and purchase button. Info button will give description of the effect(s) in the pop-up window. Purchase button will allow you to purchase that new image add it to the slider. In the ‘Effects available’ screen you can see some more pictures you can buy. There you can also find some nice animations, too. 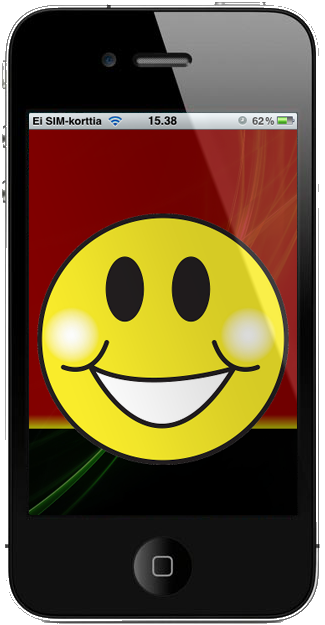 These picture can motivate the children more and more by providing excitement for the new smileys. By tapping on each picture you can have some more information about them. We would love to hear your opinion! 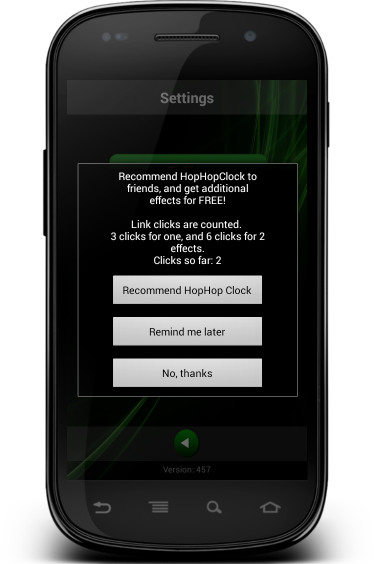 Send us a feedback(you can do it directly from the app) and rate HopHopClock! You have full privacy when you use HopHopClock. HopHopClock will only collect anonymous usage data that is used to improve the application. This data is not given to any third party, or used for anything else than improving the app. HopHopClock will not collect any personal information and does not report your location. HopHopClock will not serve any ads. The application is translated into 14 different languages: English, Finnish, Hungarian, French, German, Spanish, Italian, Japanese, Korean, Russian, Swedish, Chinese, Norwegian and Danish. Check our explainer video out!